What are the 12 Dimensions of Consciousness? A dimension is a state of consciousness. Consciousness is the state of being awake and aware of one’s surroundings. Every naturally created object is a sentient being having a conscious experience in 1 of the 12 dimensions, this includes any natural living object, rock, tree, animal, human, mountain or body of water (sea). A sentient being (as per Buddhism philosophy) has the ability to be conscious, to feel, to perceive or to have subjective experiences. Mother Earth is a sentient being, along with her oceans, mountains, land masses and all living beings on her planet. So in case you didn’t know, Earthly humans resonate at the 3rd level of consciousness in their “waking lives”, where as when they dream or sleep they are able to straddle into the lower and upper 4th, and in some rare cases into the 5th. The paradigm shift speculates that what humans perceive as “awake” and “reality” is actually the illusion (put together through mind control by the Cabal), and what is considered a dream or astral out of body experiences is actually the raw and organic truth of the soul’s expression. After all we are a spiritual being having an Earthly experience. In 2012, you can perform a Google search on 3D to 5D evolution or the Planetary Shift or Consciousness shift to 5D, all of which will return an array of spiritual awakening and truth seeking articles for you to research, discern and decide as you seek the truth. The big difference between this evolution and any other evolution that has happened on Earth (for example Lemuria and Atlantis) is that for the first time humans are able to evolve into the 5th Dimension while staying in your own physical body. What does this mean? Technically, there is no such thing as death being the final end for your physical life, but instead humans can now transcend death if they are able to raise their consciousness to the 4th and 5th through meditation, dreams or astral out of body traveling. The reference to 3D Earth is what we have been accustomed to for 2000 years, a world that has been filled with systems, rules, policies, controls, power struggles that have kept us separated from one another and living a life of separation, competition, drudgery and survival. However, with the planetary and human consciousness shift to 5D, these low vibrating systems will no longer resonate so will be eliminated as the majority of the world’s population ascends from 3D consciousness to a 5D consciousness. Multidimensional beings can go between different dimensions simultaneously! Indigos were born on the Indigo or Blue ray of incarnation and evolution but into 3-D bodies with their consciousness firmly in the 4th or 5th dimension. Crystals are born with their consciousness in the 6th dimension. Dimensions” are a means of organizing different planes of existence according to their vibratory rate. Each dimension has certain sets of laws and principles that are specific to the frequency of that dimension. 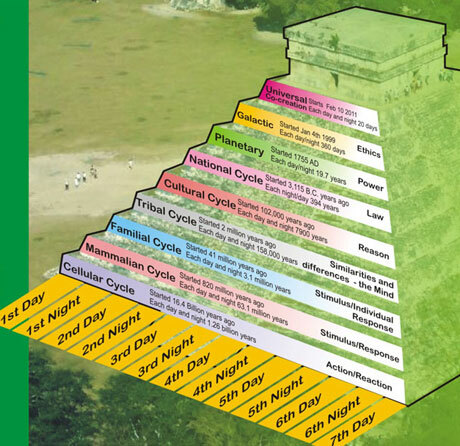 The Temple of Heaven in China emphasizes the meaning of 9 and so does the Mayan Pyramids because there are 9 levels from the 3D to get to the 12D of heaven. When one reaches 12D they have returned back to the Divine Source and Eternal Light Being. 1 The first dimension of space. Awareness as a point. The mineral kingdom resonates to this level of consciousness. 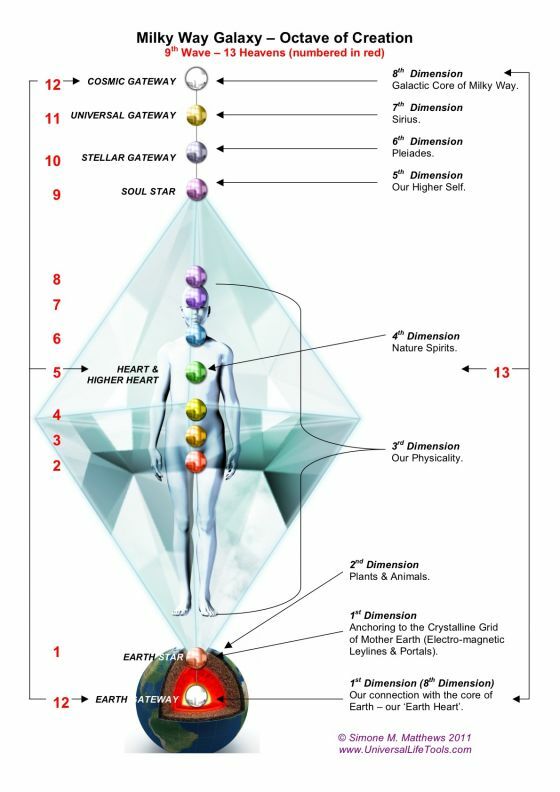 The minerals, water and genetic code in human bodies resonates to this level. 2 The second dimension of space. Awareness of point and line. The plant kingdom and lower animal kingdom resonates to this level. These beings are only conscious of their species’ identity and their need for feeding, fighting, and procreation. Live solely within the awareness of the moment. Human second dimensional consciousness is centered in the lower brain that directs the autonomic nervous system to regulate and maintain life support functions. 3 The third dimension of space. Awareness of point, line, width and breadth, height and volume. Human beings and the higher animal kingdom resonates to this level. Awareness of oneself as a separate and unique individual – very little awareness of the interconnectedness of beings and actions. The third dimension is locked in a time/space and cause/effect paradigm through the individual human souls. As humans we have the ability to remember the past and the future while remaining aware of the present. However, while using only our third dimensional consciousness much of our past remains forgotten in our unconscious mind and we usually feel a sense of separation from the whole, a feeling of limitation in achieving our desires, and a need to work hard to accomplish our goals. 4 Awareness of point, line, width and breadth, height, volume and time. The fourth dimension is also known as the astral plane. The primary consciousness of this dimension is in the astral body, which is also known as the “higher human”. The astral body is of a higher vibration than the physical body and is in a form that is known as etheric. The 4th D is the realm of the unconscious mind. Our fourth dimensional astral bodies possess advanced dreaming, imagination, psychic ability, intuition, magic, and creativity. As we expand our mind to be conscious of our unconscious mind, we can experience more and more of these qualities while in our physical form.At this level, there is the beginning awareness of the Universal Law of One or Unity Consciousness: whatever affects one of us affects of all of us. Indigos carry this awareness, which is the key to multi-dimensionality, and it leads them to be warriors for causes that heal the Earth. Realisation and practice that no one is greater than the other and that group consciousness is the path to the future. We must all cooperate for the good of all to create a better Earth. 5 Awareness of point, line, width and breadth, height, volume, time and spirit. Linear time and space do not bind consciousness here. There is NO illusion of separation or limitation. Instead, there is a constant experience of the One-ness of God/Goddess/All That Is. On the fifth dimension we live in Unconditional Love, Unconditional Forgiveness, and Unconditional Acceptance. We hold no judgement, guilt, or negativity towards the “lower” portions or aspects of ourselves that are striving to remember our “Higher Selves”. At this level, we are free to create new ways of thinking/being/doing through the seeds of unity consciousness. 6 The Christed Child or Magical Child (Crystal consciousness) has access to their magical and spiritual aspects, and a playfulness of life. Life is seen as magical and blessed. All life is directed and advanced through the work of spirit. The person in the 6th D surrenders to the flow of spirit’s evolution while exercising the right to be a creator on an individual level. 7 Fully aware of the nature of the spirited mission of the being. Christed Adult (Crystal Adult) – ready to take on a planetary mission as a “carer of higher dimension consciousness to others,” e.g. through teaching and healing on a big scale or carrying the energy in one’s aura so that others can access it on a big scale. 8, 9 8th D – Archetypal level of consciousness when the person has full control over the story of Life on Earth. 9th D – Full cosmic consciousness – has full responsibility for stewardship of the planet. The 9th D incorporates the 8th. 10 Has responsibilities at the solar level. 11 Galactic level of consciousness is achieved. 12 Gold ray of Universal Consciousness is inaugurated by being a Full Universal Being – Universal level of consciousness is achieved. You have returned to Source and are in Unity Consciousness with the physical form of your Local Universe. EMOTIONAL CLEANSE-CLEAR-CLARITY SESSIONS CURRENTLY IN PROGRESS ON AN ACREAGE IN BC COUNTRYSIDE WITH DAYTIME SLOTS AVAILABLE TO LOCAL PUBLIC ON TUESDAY AND THURSDAY AFTERNOON. I AM CURRENTLY OFFERING FREE ENERGY READINGS WITH A 20 MIN HEALING SESSION. PM ME FOR DETAILS. NEXT Private Divine Healing Arts Retreat is a 2 day Harmony 3 Event in KAUAI, HI during the week of April 14 – 21 and in MAUI, HI during the week of April 21 – 28. Focus will be Balancing and Harmonizing the Divine Feminine and Divine Masculine energies within your body, mind, heart and spirit. Limited Space for 4 or 7 Healing Group. Ask Me for More Details on this. CURRENTLY OFFERING FREE READINGS WITH A 20 MIN HEALING SESSION. What is the Lemuria Rising Mission?